This pedal gives you transparent, unobtrusive compression that offers positive enhancement of your signal. The Chime knob adds sparkle. A compressor is a compressor, right? Well, in a way as they’re all designed to do a similar job, but go to a pro recording studio and there will be a variety of compressors available, each doing something sufficiently different from its neighbour to warrant it being there. Compressor design types include optical, FET, VCA and Variable-Mu, with most of the stompbox compressors for guitar being the FET type. The one thing that defines a compressor’s character and playing appeal is the ‘bloom’ of its release, and for this design, Orange has ditched the FET compressors entirely, favouring the smoother bloom provided by an optical design with an innovative floating sidechain - plus the addition of a reissue Vactrol VTL5C3 octupler, used in certain vintage compressors, notably the LA-2A. Following the form factor of previous Orange pedals such as the Two Stroke, the Kongpressor features the same internal charge pump, which doubles the operating voltage to 18 volts, increasing the headroom. 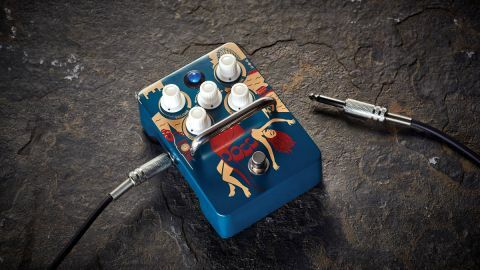 The volume knob offers up to 12dB of clean boost, so the pedal can be used purely as a booster, offering a range of volume boosts that are great for amp driving, or maybe taking things up a notch for solos, especially so with a small amount of compression dialled in. You can also get some tonal shift at the same time courtesy of the Chime knob, an active treble control that can add some useful zing or, alternatively, calm the top-end for a smoother vibe. As compressors go, the Kongpressor is very natural-sounding. It doesn’t exhibit the overly obvious audible squash with radical reshaping of the envelope that some models provide, yet the compression is there, bolstering your tone with a solid consistency and adding sustain when needed. Attack and Release knobs together deliver a range of practical options. The Attack knob has a subtle but effective influence on note transients, building in a natural front-end snap, while the Release knob affects how the note continues, which is very smoothly as its all-important bloom is induced.